Urinary Tract Infections or UTIs can cause uncomfortable and potentially dangerous effects like burning sensation when urinating, pelvic pain in women, urine with strong odor, the uncontrollable passing of frequent, small amounts of urine and if remained untreated, can potentially reach and affect the kidneys. 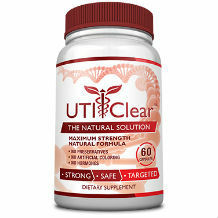 It is estimated that 50% of women will have at least one UTI in her lifetime and 20% will have recurring UTIs. For these reasons, it is imperative for all to maintain optimal urinary tract health. This review is going to examine Vital Nutrients Mannose Powder which claims to maintain mucosal lining in the urinary tract and support the integrity of epithelial cells in the genitourinary tract and when taken orally, can result in a lowered risk of developing UTIs. Vital Nutrients Mannose Powder is taken as a dietary supplement. The key and only ingredient, D-Mannose, is a simple sugar that is found in a variety of fruits. D-Mannose is believed to have the ability to prevent urinary tract infections because it can stop certain bacteria from sticking to the bladder walls, causing the bacteria to stick to sugars instead. This guides the bacteria out the urethra through the urine and fewer bacteria in the bladder translates into lowered risks of urinary tract infections. Vital Nutrients recommends taking 1/4, 1/2 or 1 full teaspoon 1-3 times daily. They recommend dissolving in water and taking between or with meals or as directed by your doctor. Vital Nutrients does not cite any possible side effects on their website. We found mild side effects associated with taking D-Mannose like bloating and loose stools. It is believed that taking high doses of D-Mannose may cause kidney damage, and for those with diabetes, it may make it harder to control blood sugar. 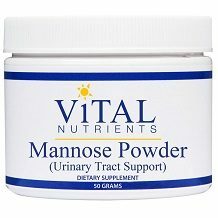 Vital Nutrients has one 50 gram bottle of Mannose Powder listed for $39.10. A 100-gram bottle is listed for the slightly reduced price of $37.60. Vital Nutrients offers a 30-day money back guarantee on unopened items but all returns are subject to a 25% restocking fee. Vital Nutrients Mannose Powder offers a high concentration of D-Mannose that is believed to support optimal urinary tract health. They do offer a money back guarantee with the caveat of a 25% restocking fee. This item compared to others available on the market is expensive. It is discouraging that if you choose to invest in this product and rely on it to optimize urinary tract health, and you find it does not work for you, you will waste a quarter of the cost of the purchase simply for trying to return it. Vital Nutrients offers nearly no information about their Mannose Powder, how it works or what it has to offer above their competitors. With a variety of products on the market that not only assist in preventing future UTIs, but also treat immediate symptoms, we found Vital Nutrients D-Mannose to be quite limited in terms of its benefits. Those who know the pain and discomfort that comes with getting a UTI do not want to waste their money on a product that will not alleviate the symptoms and prevent potential UTIs from occurring. With better and cheaper options available on the market, Vital Nutrients Mannose Powder is not a product we would be inclined to rely on for optimal urinary tract health and relief from UTIs.